We strive to run on time so your family won’t be kept waiting, and we ask you to arrive for your appointments on time as well. We understand that you are busy, and your time is valuable to us! We only deviate from our schedule in the event of dental emergencies that must be taken care of immediately. If you are unable to keep your scheduled appointment, please give us at least 48 hours notice. We accept cash, checks, debit cards and most major credit cards. We also offer in-house payment plans and flexible financing through CareCredit® for patients who qualify, because we understand that monthly payments can make it easier to fit dental treatment into your budget. Our goal is to remove financial barriers so that all of our young patients can receive the care they need. We are an insurance friendly office, and we will be happy to help you maximize your benefits. Call us about your plan! Please bring your insurance information with you to your child’s first visit. We may ask you to confirm this information at subsequent visits so we can remain up-to-date and fully informed to serve you. As a courtesy to you, we file all claim forms electronically, provide postage for special claims and track claims for you. Oral healthcare for your child starts just as he or she begins teething. With our help, your child will develop a beautiful smile full of healthy teeth. The American Academy of Pediatric Dentistry recommends that children have their initial visit to the dentist when their first tooth appears or by their first birthday. At The Smile Spot Children’s Dentistry, we are committed to serving our youngest patients, and we are excited to watch them develop beautiful, bright smiles! At your first visit, we educate you about nutrition, oral home care for your child and what to expect for your child’s smile in the years to come. We provide quality treatment and prevention guidance based on your child’s individual needs. At The Smile Spot Children’s Dentistry, we get to know your child — not just their medical history, but their past dental experiences, your reasons for coming to see us, and your goals for their smile. Our purpose is to gradually bond with your child and to make him or her feel safe and secure at every visit to our office. The earlier we can start building trust with your child, the better. We want to ensure that you and your child receive a thorough consultation with Dr. Stephen, and that you have plenty of time to ask our team any questions you may have. Afterward we will outline any existing dental problems, proposed treatment and an estimate of all costs. Oral hygiene instructions will also be given with suggestions to help you and your child care for their teeth. What Can I Expect at My Child’s First Dental Visit? Your child should visit the dentist when the first tooth appears or by his or her 1st birthday. As a parent, you can make the first visit to the dentist enjoyable and positive. Dr. Stephen and our team will explain all procedures and answer any questions. We recommend coming to visit our office prior to the child’s scheduled appointment so that your child can meet our friendly team. While you are here, your child can check-out a book from our dental library. Also, it is best if you refrain from using words like “hurt,” “needle,” “pull,” and “drill” around your child. These words can cause a child to feel unnecessary fear. 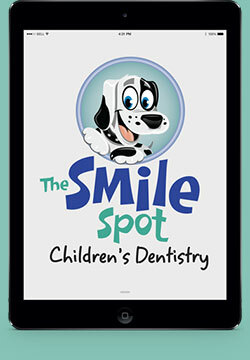 The Smile Spot uses a child-friendly vocabulary to make visits pleasant and non-frightening for your child. Trying to over prepare your child for their first visit can actually cause your child to feel more anxious and nervous. Instead, we recommend saying something like, “We are going to see Dr. Stephen, and he is going to count your teeth. 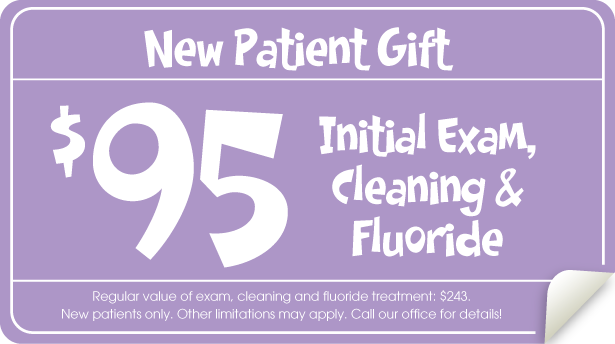 It will be fun!” We are excited to introduce your child to our unique and fun dental office. You and your child will experience the fun of dental check-ups! How Do I Properly Care for My Child’s Teeth? Begin daily brushing as soon as your child’s first tooth erupts. A pea-size amount of fluoride toothpaste can be used after your child is old enough not to swallow it. By age 4 or 5, children should be able to brush their own teeth twice a day with supervision until about age seven to make sure they are doing a thorough job. However, each child is different. Dr. Stephen can help you determine whether your child has the skill level to brush properly. Proper brushing removes plaque from the inner, outer and chewing surfaces. When teaching children to brush, place toothbrush at a 45 degree angle; start along gum line with a soft bristle brush in a gentle circular motion. Brush the outer surfaces of each tooth, upper and lower. Repeat the same method on the inside surfaces and chewing surfaces of all the teeth. Finish by brushing the tongue to help freshen breath and remove bacteria. Flossing removes plaque between the teeth where a toothbrush can’t reach. Flossing should begin when any two teeth touch. You may wish to floss your child’s teeth until he or she can do it alone. Dr. Stephen recommends using child-friendly dental flossers. Your child should use dental flossers at least once a day to floss between all of his or her teeth. At your child’s first visit, Dr. Stephen and his team will show your child the proper way to use a dental flosser. Good oral hygiene removes bacteria and the left over food particles that combine to create cavities. For infants, use a wet gauze or clean washcloth to wipe the plaque from teeth and gums. Avoid putting your child to bed with a bottle filled with anything other than water. For older children, brush their teeth at least twice a day and floss at least once a day. Also, watch the number of sugary snacks and sugary, acidic drinks your child eats and drinks. The American Academy of Pediatric Dentistry recommends six-month visits to the pediatric dentist beginning at your child’s first birthday. 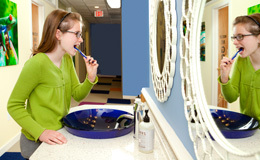 Routine visits will start your child on a lifetime of good dental health. During your child’s visit, Dr. Stephen may also recommend protective sealants or home fluoride treatments for your child. Sealants can be applied to your child’s teeth to prevent decay on hard to clean surfaces. How Can I Seal Out Decay on My Child’s Teeth? A sealant is a clear or shaded material that is applied to the chewing surfaces (grooves) of the back teeth (premolars and molars), where four out of five cavities in children are found. This sealant acts as a barrier to food, plaque and acid, thus protecting the decay-prone areas of the teeth.